Instructor Kevin Whitehead will answer all your questions when it comes to fixed wing microlight training in Scotland. Who can learn to fly a microlight aircraft? Anyone. Individuals who are reasonably fit and within the weight limits. What will I need to gain my microlight pilots licence (NPPL)? Complete a minimum of 10 hrs solo flight training which includes 5 hrs of solo navigation training, including two qualifying cross country land aways. Complete 5 ground school examinations, including Navigation, Meteorology, Air Law, Human factors and Aeroplane technical. How much will it cost to complete the course? Depending on the individual, the average cost of attaining your licence will be between £3,500 to £4,500 to complete the full course of training. Students are charged for flight lessons based on ‘engine time’ (from engine start to engine stop). The current rate for a 1-hour lesson on a school fixed-wing aircraft is £135 pro rata. All flight lessons include a pre-flight classroom briefing that will cover theoretical and practical elements of the upcoming air exercise. The pre-flight briefing takes approx 20 – 30 minutes and there is no charge for this classroom briefing. There is a nominal charge of £30 for each ground school exam when taken. Where a student feels he needs supplemental ground school tutoring, this can also be arranged on an hourly paid basis. Will I need to buy my own aircraft? Most students eventually purchase their own aircraft. Some purchase an aircraft outright or join a syndicate of owners. Good condition second-hand aircraft cost less than you would normally spend on a second-hand car. New fixed-wing microlight aircraft are also relatively inexpensive compared to conventional light aircraft. Can’t afford your own aircraft, then no problem – Alba Airsports also offer suitably qualified pilots the option to self-hire our school aircraft from as little as £95/hr, which includes the fuel and insurance. What’s the cost of aircraft ownership? Under the CAA Permit to Fly scheme, microlight aircraft owners can perform most scheduled maintenance requirements on their own. This keeps the cost of ownership to a minimum. An annual inspection by a certified inspector is required to ensure the aircraft is safe and airworthy (similar to a vehicle MOT) and the cost for this inspection is approximately £150. Microlight aircraft operate from airports, airfields, farm strips, private fields etc.. so the cost of hangarage varies depending on the location and facilities. Monthly hangarage rates for a fully rigged microlight aircraft average from £120/month at Perth Airfield where Alba Airsports is based. For those in syndicate ownership, the costs are shared by agreement amongst the aircraft owners, keeping the cost of ownership lower still. 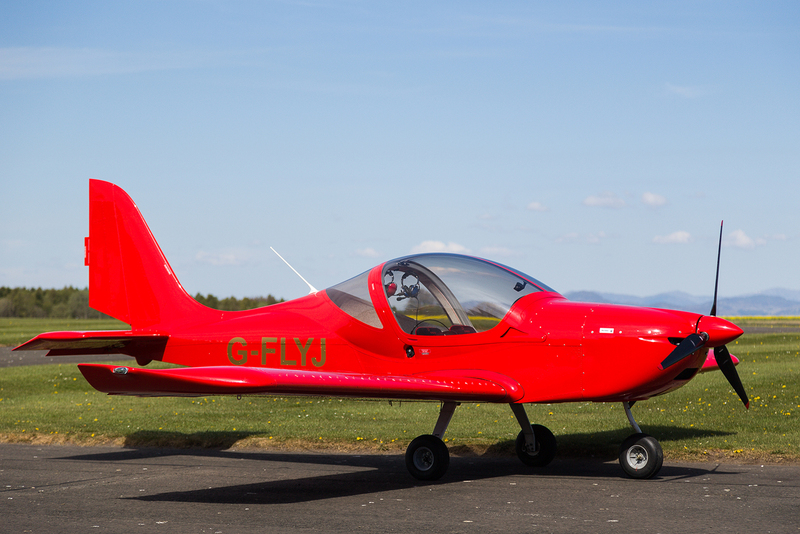 Used as our primary training aircraft, this is the latest and most luxurious model of the successful EV97 microlight and comes complete with glass cockpit panel and ballistic recovery parachute. The Eurostar is a modern high-performance microlight with extremely smooth and responsive handling. Truly a ‘pilot’s aeroplane’, the Eurostar is powered by the well-proven and reliable 80hp Rotax 912 engine which gives the aircraft an outstanding power-to-weight ratio, enabling a cruise speed of around 100 mph, yet still retaining the short field characteristics of more traditional microlights. The aircraft is a delight to fly with outstanding all-round visibility and an effective cabin heater. It is popular with trainees and experienced pilots alike who value its high performance which in some ways puts many Group A training aircraft to shame. Consequently, it is in high demand! As well as being our training aircraft, we also offer G-FLYJ for hire to qualified pilots who are members of the Scottish Aero Club at an hourly rate of £105 wet, giving pilots the convenience and availability of a high-end aircraft without the large financial outlay. A true favourite amongst our pilots! 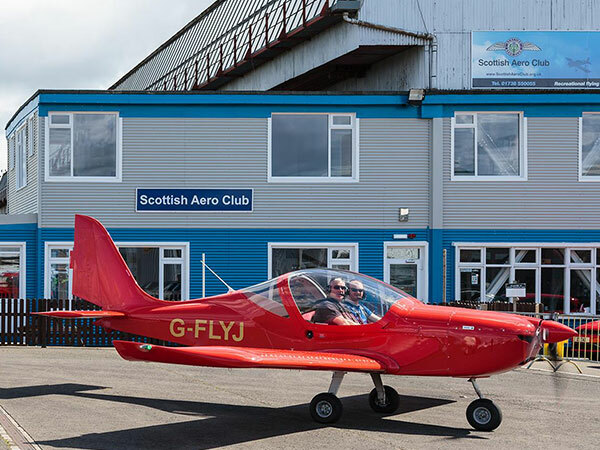 We also offer this trusty steed for hire to qualified pilots who are members of the Scottish Aero Club at an hourly rate of £95 wet, giving pilots the convenience and availability of a high-end aircraft without the large financial outlay. November Whiskey can be hired per the hour or day, it’s your choice. If you would like a flight in one of our aircraft, then please contact us on 07411 747272 to make a booking. Or if you would like to purchase one of our gift vouchers, then simply visit our Gift Voucher page. We offer intensive training courses for potential pilots, as well as Air Experience Flights to the general public and private groups. Potential pilots will be able to trial and undertake training to Private Pilot Licence (Gyroplane) standard PPL(G). Ever fancied flying a plane – for fun to try it out or to gain an NPPL – National Private Pilot’s License? 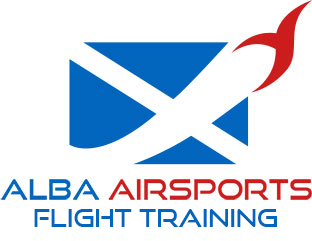 At Alba Airsports, you can have a go in one of our fixed wing microlight planes. Explore the amazing Scottish Countryside. Fly over Perthshire or have look around the Scottish Highlands. The best way to find out what flying a flex wing microlight is all about, is to come along and have an introductory experience flight. You’ll be given a safety briefing, and an overview of the aircraft controls, and once seated securely you and your instructor will take to the skies for the experience of a lifetime.